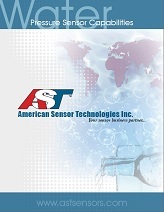 A pressure sensing element will come in contact with varying pH levels, depending on the type of water, chemicals added and the quality of the water purification process. AST packages pressure sensors using Krystal Bond™ Technology and our one piece, 316L stainless steel sensing element. 316L SS offers excellent media compatibility for residential and commercial water applications and is NSF61 compliant.